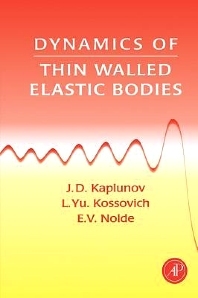 Written by a well-known group of researchers from Moscow, this book is a study of the asymptotic approximations of the 3-D dynamical equations of elasticity in the case of thin elastic shells of an arbitrary shape. Vibration of shells is a very useful theory in space techniques, submarine detection, and other high-tech domains. Dynamics of Thin Walled Elastic Bodies shows that refined shell theories used in engineering practice give a distorted picture of the high-frequency or non-stationary dynamics of shells, and offers new, mathematically more consistent ways of describing the dynamics of shells. Researchers at naval research establishments and aerospace facilities, as well as civil (structural) engineers and researchers in the fields of mechanics, acoustics, and applied mathematics. Statement of the Problem and Modern Examples. Low-Frequency Approximations. Long-Wave High-Frequency Approximations. Short-Wave Approximations: The Error Estimate in Dynamics of Thin Walled Bodies. Vibrations of a Body of Revolution. A Thin Walled Body under Surface Loading. Higher Order Theories of Plates and Shells. Long-Wave High-Frequency Vibrations of Thin Walled Body Immersed in Continuum. Radiation and Scattering by a Thin Walled Body. Non-Stationary Wave Propagation. General Notation. References. Subject Index. Professor J D Kaplunov is a senior scientist at the Institute for Problems in Mechanics, Russian Academy of Sciences. His research interests are in solid mechanics, acoustics and asymptotic methods. Professor L Yu Kossovich is Dean of the Faculty of Mathematics and Mechanics and Head of the Department of Mathematical Theory of Elasticity and Biomechanics at Saratov State University, Russia. His research interests are in solid mechanics, wave propagation and asymptotic methods. Dr E V Nolde is a researcher at the Institute for Problems in Mechanics, Russian Academy of Sciences. Her research interests are in shell theory, acoustics and asymptotic methods. "The book is well written, with good quality figures and references at the end. It gives good examples...so this book may be used when preparing a course in Mathematical models in dynamics of solids. In the opinion of the reviewer, Dynamics of Thin Walled Elastic Bodies is recommended both for individual researchers in mechanics of thin-walled bodies and for libraries." --APPLIED MECHANICS REVIEWS, Vol.52, No.10, October 1999.